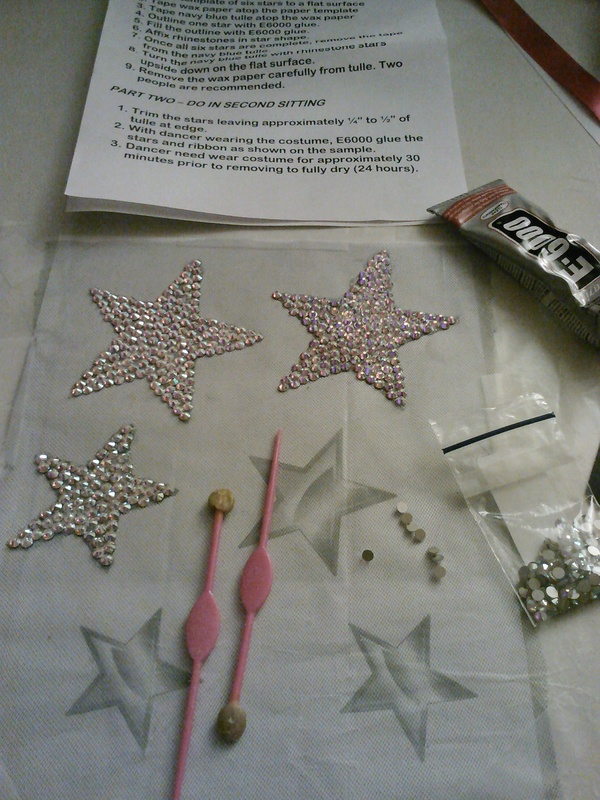 Rhinestone Stars – A Step by Step Process. 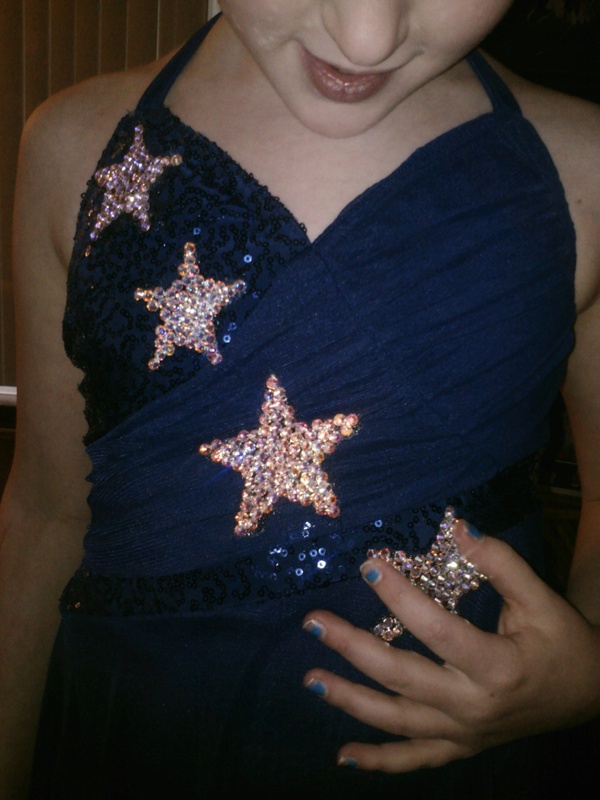 When I first saw that we had to make stars out of rhinestones for my daughter’s lyrical costume, I was intimidated. I can often visualize things really well, but the execution of creating things like that never usually turns out very well. Luckily, the dance studio gave us everything we needed to successfully recreate the stars from the sample. Before I even began the project at hand, I took pictures of the sample at the studio. I took a front view, and a back view. Unfortunately, the back view didn’t clearly show me that the star needed to be on the shoulder, rather than in the middle. Luckily, I happened to be talking to some of the other moms who were rhinestoning the same costume up at the studio, who pointed out the correct placement of the star. Good thing I hadn’t done Grace’s yet! First step to this project, was to gather all my materials. I also washed the table I was going to be working on. The dance studio gave us a printed pattern, which I taped on the table. I then taped a piece of wax paper over it, and a piece of blue tulle over that. Then, I was ready to begin. Step 2: Outline the first star with E-6000, and fill it in. 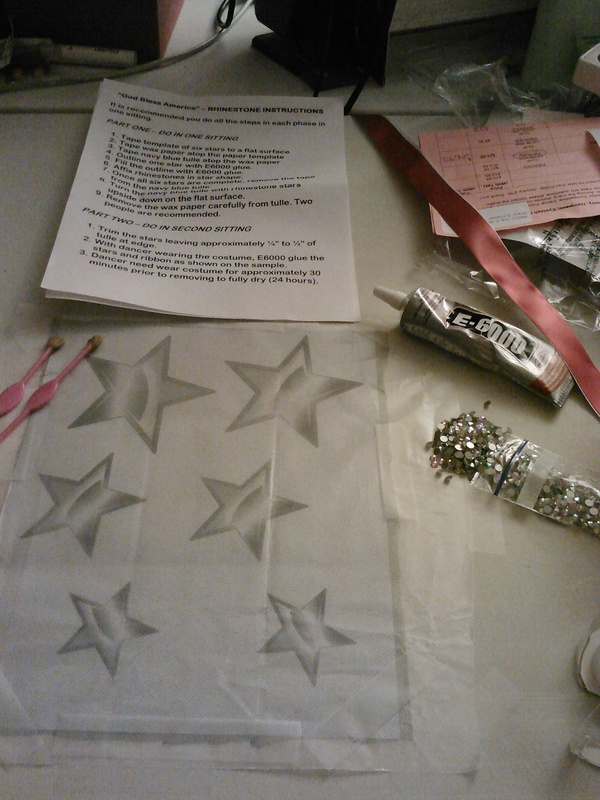 Next, start applying rhinestones all over star shape. Being a First-born aka perfectionist of sorts, meant I spent a bit of time and effort making sure all the rhinestones were touching, and created a star shape as best as I could. This task made a bit of a mess, but the end result was worth it. Step 3: After realizing how fast the glue dried (I had to reapply glue by the time I got to the end of the large star), I realized I should only put the glue on one point at a time, then fill in the middle. I used this technique on the second star, only to realize the middle was a pain to do with all the points done first. By the third star, I had a system down of starting with one point, then doing the middle, then doing each of the other points around it. This made the last 3 go much faster. Step 4: Once all the stars were done, I had to peel them off the wax paper (a brilliant idea they had here), and flip the piece of tulle with the stars on it upside down. Step 5: After letting it dry overnight, it was time to cut the tulle down around the stars, and affix them to her costume. She had to be wearing the costume while I glued the stars on, so that the material would be properly stretched. If we didn’t do it this way, when she put it on, it could have pulled the stars apart, or ripped the dress. 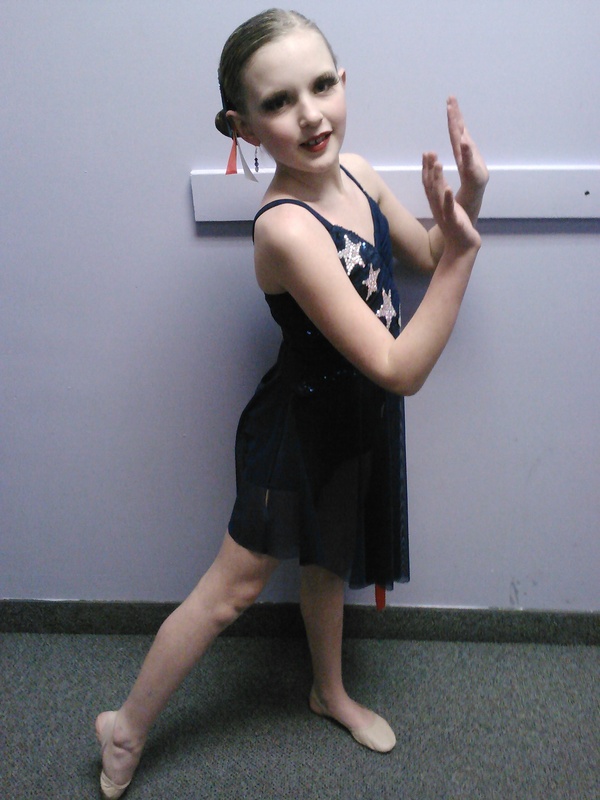 Grace was very excited to wear her beautiful lyrical costume. She was not so excited once I started gluing the stars on, at how cold it felt through the fabric! I was glad I had taken the picture of the sample on my phone, so I could zoom in and out to figure out exactly where to place which stars. Once all the stars were in place, Grace had to keep it on for a half an hour to let them dry. I think an hour would have been better, as the star on the back kept wanting to pop off. I just kept holding it on (pushing a bit) after she took it off. No re-gluing required! Step 6: With the 5th star on the front, towards the bottom, we also had to glue two ribbons on. When gluing ribbon on, you need to be a bit more careful with the glue. I noticed some of the glue had gotten on another part of the ribbon, and tried to wipe it off. Apparently, my hands may have been a bit dirty, or something, as there appeared a smudge on the white ribbon. 😦 I think it has all rubbed off now that it’s completely dry. The costume was complete, and ready on time for pictures the following weekend!